The KwaZulu-Natal Agricultural Union, Kwanalu has announced the much anticipated winner of the Kwanalu 2018 KZN Young Farmer of the Year at its annual Congress held at the Royal Show grounds in Pietermaritzburg today. 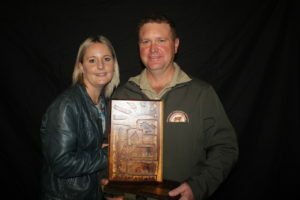 37 year-old Groenvlei farmer, Rustin Shawe, was awarded the provincial title of Kwanalu 2018 KZN Young Farmer of the Year at a ceremony attended by Kwanalu members, fellow farmers, agricultural-industry leaders and multiple farmer’s association representatives from all over KZN, as well as guest speakers, President of Agri SA and farmer Dan Kriek, political analyst and freelance journalist Melanie Verwoerd and Dr Mark Manley, strategy, leadership and transformation specialist. Rustin will go on to represent the province for the 2018 Toyota SA / Agri SA National Young Farmer of the Year title, going up against top candidates from all eight provinces, in a bid to secure the much sought after title, as well as a brand new Toyota Hilux Single Cab. The winner of the 2018 Toyota SA / Agri SA National Young Farmer of the Year will be announced on October 18 at the Agri SA Young Farmer of the Year event to be held in Johannesburg. “This year’s entries make us proud of the vast farming talent we have in KZN,” said CEO, Sandy La Marque, speaking at the event. The Young Farmer of the Year competition is open to farmers under the age of 40, male or female who are full members of their provinces’ agricultural unions. The judging and evaluation of the farmers and their agricultural practices, takes place at provincial level with the applicants being evaluated on all aspects of their businesses including their overall vision for the future of their farm/ business. The main features on which young farmers are judged is their management/ business philosophy as well as the technical competence with which their philosophy is applied. Rustin, farms with 1 850 commercial beef and Droughtmaster stud breeding herd, 1 000 follower heifers and 600 long yearlings on 8 600ha in Groenvlei near Utrecht, the northern mountainous region of KZN. With 16 years of farming experience and 15 years on the current farming set-up, Rustin has brought noted improvements to the family business namely with the development of his Droughtmaster stud which impressed the judges. “The focus on my Droughtmaster stud has increased my weaning weights in my herd as well ensuring uniformity thanks to the predictability of the progeny of the Droughtmaster. These Droughtmaster are fast infiltrating my Grassfields Beef herd,” explains Rustin. 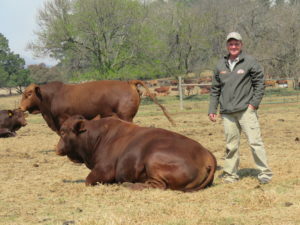 Other changes implemented by Rustin that have contributed to the success of the business include his decision to keep all his heifer weaners every year and let “nature takes it course”, to increase his herd sizes over the summer months, a decision to keep all bull calves thanks to a loan from the Landbank, the purchase of a 700ha grazing farm for summer veldt grazing and the building of four dams on the properties which have transformed and prolonged the life of his grazing paddocks. Grassfields Farm also boasts its own sale complex which hosts an annual production sale. Using social media as a means of marketing, Rustin hosts the annual sale of his Grassfields beef and Droughtmaster stud herds – a sale that is well known in the industry. Currently on Grassfields Farm, Rustin farms 1 500 Grassfields beef cows and heifers, 350 Grassfields beef Africa Droughtmaster stud cows and heifers, 470 Grassfields one year-old heifers, 100 Grassfields beef Africa Droughtmaster one year-old stud heifers, 600 long yearling oxen, 150 one year-old bulls, 90 two year-old bulls and eight Grassfields beef Africa Droughtmaster studs bulls. Along with his cattle, the farm has 30 riding horses, used by his herdsmen, and 20 breeding mares, that are an important factor due to size of the operation. Rustin is an active community member and was the vice-president of the local farmers association, the Groenvlei Boerevereniging. On receiving his award, Rustin said the title was an honour and a privilege and that he looked forward to representing KZN farmers at the national event. He thanked his wife, Monick, for her support, his father for being his mentor and affording him the opportunity to farm, and his staff which he credited for the success of the business. 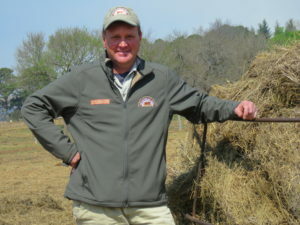 “If we are proactive I believe we have a great future in this country but that we all need to address the land issue as a critical part of a successful future in farming in SA,” said Rustin.